Whether you call it soccer, like us, or football, like the rest of the world, we have your virtual ticket to South Africa right here. Google Earth is proud to feature 3D models of all ten stadiums and the nine cities of host nation South Africa. 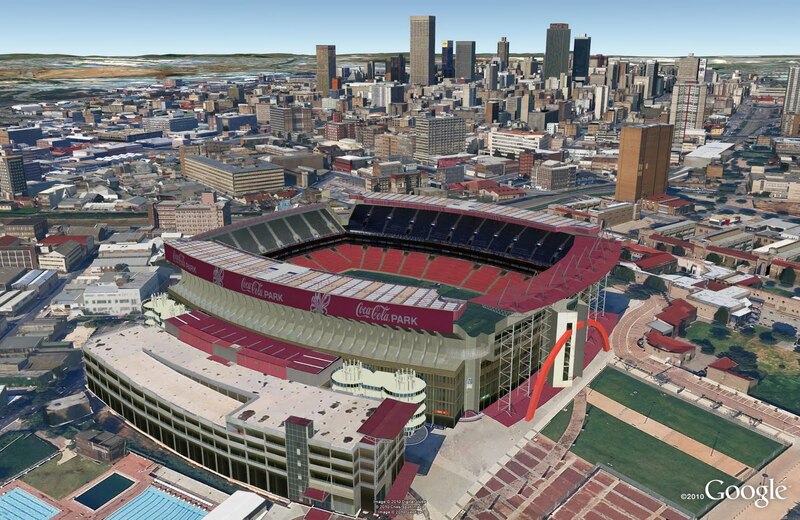 To check it out for yourself, download this 3D tour to explore the stadiums in Google Earth, or check it out using the new Earth view in Google Maps. Fly into Green Point Stadium for a seat looking out at Cape Town’s famous Table Mountain. From there you may want to head over to the dramatic arch that suspends Durban’s Moses Mabhida Stadium. The distinctive multi-hued orange shell of Soccer City Stadium in Johannesburg is a must see. It’s here where South Africa kicks off against Mexico in the first game on June 11, and where the final takes place exactly a month later. South Africa offers much more than soccer stadiums of course, which is why we’ve also modeled thousands of buildings around the country. These 3D cities can help you get a feel for why South Africa receiving the world’s attention. And if you’re lucky enough to be there, you might like to see how close the stadium is to your hotel. Finally, since several of the stadiums are either newly constructed or heavily remodeled, you can use the Historical Imagery feature in Google Earth to see the transformation over the years. Open up Google Earth, turn on the Historical Imagery layer by clicking on the clock button at the top, and slide the bar to travel through time. We realize that the United States winning the Cup is a long-shot, but the 3D team here in Boulder, Colorado will be cheering for team USA anyway! Great, great, great…for an economically immobilised, but enthusiastic South African soccer and stadium fan, this gives invaluable insight. How do you get the details onto the shape/figure? I do not understand what you did! What's with the music, I'd rather hear a million vavzuela's!! modeling parts does take a lot of time and effort and i think its worthwhile though especially when you look at others work, http://www.turbosquid.com/Search/Artists/akalisiak?referral=akalisiak , this is just a small sample of the thousands of people who do these things in other programs. it really lets you appreciate the effort and dedication some have for the model of 3d models.